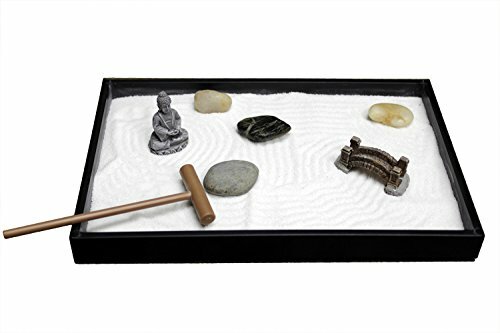 Don’t confuse a Zen garden with a Japanese garden. While Zen gardens are a type of Japanese garden, not all Japanese gardens are Zen gardens. 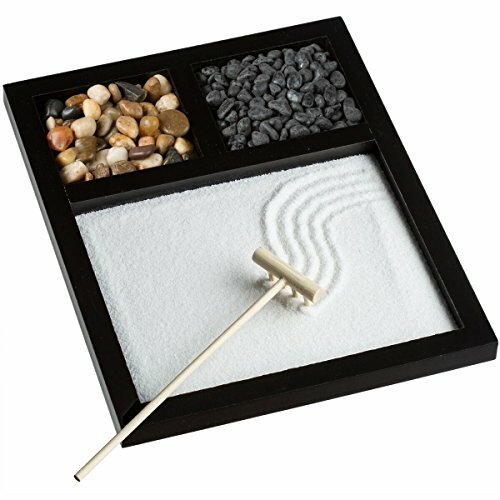 A Zen garden is one devoid of water. It’s comprised mostly of sand and rocks while other types of Japanese gardens can be lush with shrubs, koi ponds, bridges, etc. Zen gardens are also referred to as Japanese rock gardens or by the proper name, “karesansui” (dry landscape garden) [source: Insidekyoto.com]. If you’ve never seen a Zen garden, you might think the idea of just a rock/gravel garden sparsely mixed with larger boulders and maybe a few shrubs would be ugly, but it’s quite the opposite. There really is a minimalist, stark beauty to these gardens. They also serve a purpose in the ever changing nature of them as you rake your patterns in them on a regular basis as part of a meditation exercise. Below we set out a huge collection of the most beautiful Zen gardens in the world (many of course are in Japan). Below that we set out a few miniature Zen gardens for indoors. As you’ll see below, the main material is sand, gravel, small pebbles or crushed rock (gravel). What’s interesting is there is no one type of rock or rock size used. Some use larger pebbles while others fine sand and everything in between. Large boulders are used sparingly to create depth and texture in the garden. They serve as sculptures. Many of these gardens are surrounded by lush garden landscapes that incorporate water, bridges, various trees and plants, moss and shrubs of all types. 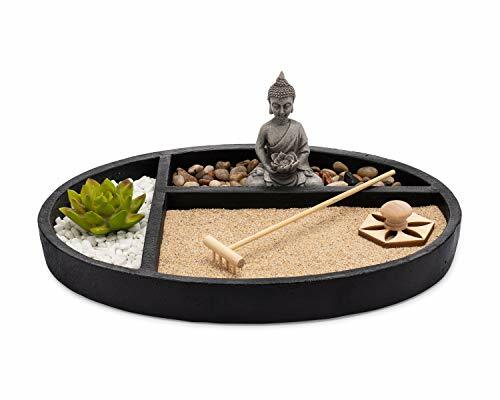 Get inspired to create your own Zen garden in your backyard from the many designs and examples below. View from Hyakumanben Chion-ji Temple’s Peaceful Gardens. The Japanese rock garden or “dry landscape” garden, often called a zen garden, creates a miniature stylized landscape through carefully composed arrangements of rocks, water features, moss, pruned trees and bushes, and uses gravel or sand that is raked to represent ripples in water. The Japanese rock garden Karesansui) or “dry landscape” garden, often called a zen garden, creates a miniature stylized landscape through carefully composed arrangements of rocks, water features, moss, pruned trees and bushes, and uses gravel or sand that is raked to represent ripples in water. Sand and Stone Garden. This is one of the five gardens located at the Portland Japanese Garden. This is located in the Pacific Northwest in in Portland, Oregon. I am a Photographer level member of the Portland Japanese Garden as required by the Garden for Commercial use of photos. Koyasan, Japan – November 16, 2010: Banryutei Rock Garden in the Kongobuji temple complex. This temple is known as the headquarters of the Koyasan Shingon sect of Buddhism.This sect was introduced to Japan by Kobo Daishi in 805.World Heritage Site.Largest rock garden in Japan. Japanese garden seen from inside a traditional tatami room. A beautiful small cairn sculpture on the beach near Lake Michigan. Here’s an idea – you can apply the Zen practice on a beach if you live near one or are visiting. Bao Loc, Vietnam – Rock Garden with the rays of sunshine radiating in the sky creates a peaceful feeling at Bao Loc, Vietnam. Tofuku-ji Temple, which was founded in 1236, is the head temple of the Tofuku-ji School of Rinzai Sect of Zen Buddhism. Tofuku-ji Temple is one of the most popular spots for Kyoto’s beautiful autumn foliage. The maple trees beside the Tsuten Bridge in the temple are its centerpiece. Karesansui, Japanese traditional landscape gardenn at Tofukuji temple, Kyoto, MiniKyoto. Bainbridge Island, Washington United States – A beautiful summer day at Bainbridge Island, sunlights bright on the Japanese garden and the cozy guest lounge at the Bloedel Reserve. 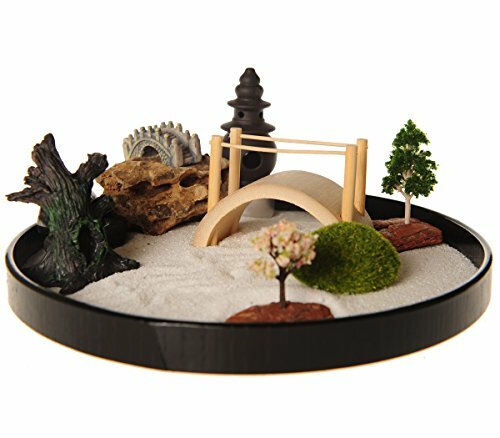 This is an example of a small Zen garden that you could easily replicate in your backyard. Zen garden at Hyakumanben Chionji Temple in Kyoto, Japan. This is an excellent small Japanese Zen garden idea for your backyard. Detail from Zen garden, which is Japanese type rock garden presenting miniature landscape. It is carefully arranged meditation place with rocks, water, or water features, sand, moss, trees and bushes . Kyoto, Japan – A stone lantern in the traditional zen garden of Shoren-in Temple, a Buddhist temple located Kyoto’s Southern Higashiyama district. Zen rock garden at the Japanese Tea Gardens in Portland Oregon. Small Zen garden in between Chion-ji Temle buildings walls. It is Japanese type rock garden presenting miniature landscape. It is carefully arranged meditation place with rocks, water, or water features, sand, moss, trees and bushes . Detail from Zen garden, which is Japanese type rock garden presenting miniature landscape. It is carefully arranged meditation place with rocks, moss, trees and roots with white wll in background. That is in Chion-ji temple in Kyoto, Japan..
Return to all types of gardens as well as our epic backyard ideas article here. If you like the meditative aspect of this type of garden, you can do it indoors with miniature Zen gardens with small rakes. Check out a few popular examples below.